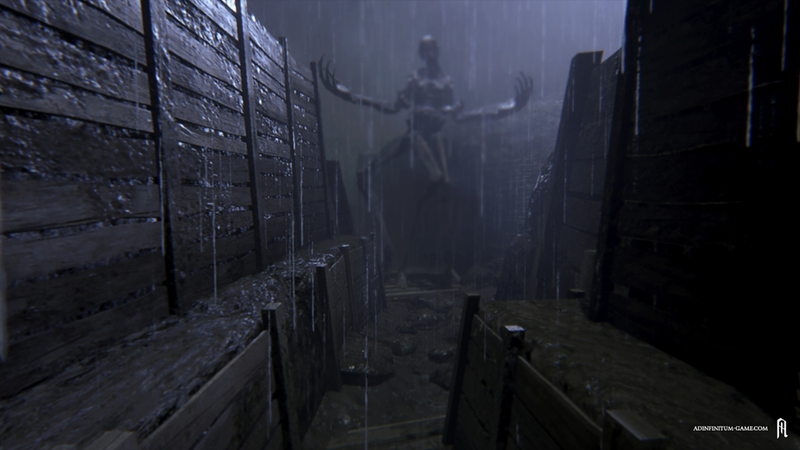 Ad Infinitum is an atmospheric single-player horror game, which puts you into a World War I setting seen through a first-person perspective. You find yourself in the trenches of a forlorn battlefield where your are being hunted by vicious creatures. Solve puzzles to clear pathways and sneak through trenches to hide from vicious creatures. Avoid dangerous threats and try to escape this world of pain and death. Besides the realistic graphics the game features a stealth system, puzzle-solving and exploration of the vicious game world which all culminates in a subtle yet intense story. The surrealistic setting is based upon historical background information that was used as an inspiration to create the game world. The game features a vicious horror atmosphere set on a surrealistic WW1 battlefield. Since this is NOT a shooter in any way, you are forced to hide from and sneak around dangerous creatures and other deadly threats. Apart from stealthing you will be encouraged to explore the game world for goodies while also open new paths by solving puzzles. Apart from all that we work together with the history departement of Uni Hamburg, where they help us to get a proper image of the political agenda and the mindset of that time.